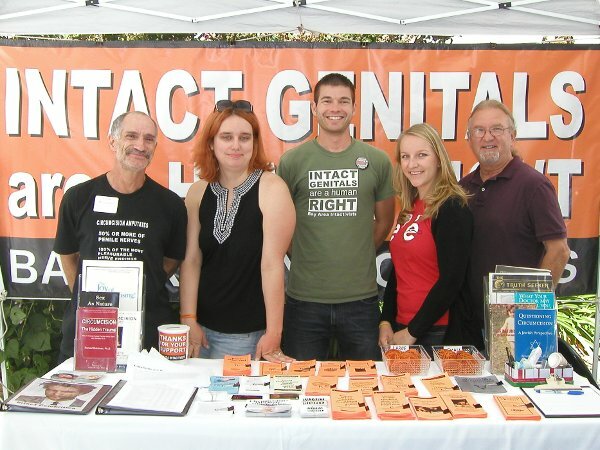 Among the exhibitors were five volunteers from the local human rights group Bay Area Intactivists who were present to educate about the damage caused by male circumcision. Visitors to their tent were able to pick from an array of free literature, stickers, and bracelets. The group also brought various books for perusing and displayed a shot glass of juice to demonstrate how little blood loss it takes for an infant to die from circumcision. The intactivists received a warm welcome from the fair organizers and attendees as well as from their fellow exhibitors. The next baby fair to be attended by Bay Area Intactivists is the San Francisco Birth and Baby Fair which will take place Saturday, September 29 at Fort Mason in San Francisco.